Located at the mouth of the Credit River, west of Toronto, Port Credit is part of the City of Mississauga. This was a traditional meeting and trading place between local Mississauga Indians, and French and British traders - hence the name 'credit'. The village of Port Credit is Mississauga's waterfront. As such, it has many shops, restaurants and pubs. Located next door to Toronto, there is easy access to the city via GO Train (the inter-urban rapid transit train) and municipal transit. Port Credit has two principal harbours. Port Credit Marina, with 800+ slips, is the largest on Lake Ontario. Located 1.25 nm east is the Lakefront Promenade complex, also owned by the city. It is home to Port Credit Yacht Club and a municipal marina. In decent visibility, Port Credit can be raised from well offshore. About 3nm west of the harbour are 2 tall chimneys belonging to Petro Canada, marked with RED lights. These are charted. There are 2 harbours in Port Credit. Port Credit harbour is located at the mouth of the Credit River. Just over 1 nm east is Lakefront Promenade, a large, man-made harbour that is shared by the public marina and the Port Credit Yacht Club. As you approach Port Credit harbour, you will see a breakwater created by a grounded freighter. There is a Q Fl RED on its bow. Give this wide berth as cutting close will blind you to traffic in the channel. When you come around the bow, you will see the F GREEN light on the end of the portside breakwater. Passing between these will bring you into the harbour. Alternatively, you can continue straight ahead, holding a course of approximately 287oT and enter the mouth of the Credit River.There is a Fl RED light at the harbour mouth. Follow the river north approx 1/4 nm. The Credit Village Marina will be on your port. Just north of the Credit Village marina there is a bridge crossing the river. On the west side of this bridge is a replica lighthouse with a flashing white light. This is NOT an aid to navigation. Do not use this light to set a course into Port Credit harbour. Port Credit Harbour Marina is the largest on Lake Ontario. With nearly 900 slips, it has transient docking for 50 visiting sailors. This is a full-service marina. There is a fuel dock (diesel and gasoline) and a pumpout station. A wide range of repair and maintenance services are available from businesses located right within the marina. These include engine, mechanical, electrical, rigging, fiberglass and canvas repairs. There is a travel life as well as mast crane. There is a sail loft near by and they will come to your boat. There are washrooms, showers and laundry facilities. A picnic area is near by. Internet service is available. One of the largest chandleries on Lake Ontario is located here - Mason's. This marina is located up the Credit River on the east side. The marina has 60 slips, all for transient sailors. There is no fuel dock. Water and power are available at slips as are washrooms, showers and laundry facilities. There is a popular bar/restaurant on-site. Located right in the heart of Port Credit, pubs, restaurants and shops are within steps of the marina. Lake Promenade is a man-made harbour located approximately 1.1 nm east of Port Credit harbour. As you approach the harbour, you will see a Q RED light at the end of the outer seawall. This leads you into the main harbour. If you bear to the port, you will instead enter into the Western Cove of this harbour. There are no lights marking this entrance. The first facility you see upon entering the harbour is PCYC on your port. This is a well-run club with excellent amenities, a busy sailing and social calendar and active membership. PCYC is the home club for the Lake Ontarioo 300 race and the Lake Ontario Short-handed racing series. There are 450 slips. Transient docking is available on a reciprocal basis. There is no fuel dock but there are pumpout facilities. Water and power are available. There are washrooms, showers and laundry facilities. There is a travel life and internet access is available. Their beautiful clubhouse has a lounge, bar, cafe and a very well-regarded dining room. Other amenities include a swimming pool and beautiful grounds with picnic and BBQ areas. Situated north of PCYC, this city-owned marina has 175 slips with approximately a dozen transient slips available. There is no fuel dock. There is a pumpout station. Water and power are available. There are washrooms, showers and laundry facilities. There is a snack bar and a lovely patio pub. Peel Regional Police Marine Unit is based out of the marina. Here, a sailor will find virtually everything they will need for maintenance and repairs - either in the harbour or very close at hand. Barry's Vehicle Upholstery is a full-service marine uphostering facility. They make or repair all types of canvas and cushion products. They are located a short taxi ride from the harbour. Bristol Marine is a full-service marina repair facility. Thei mechanics carry out all service and maintenance on diesel and gasoline engines, electrical and refrigeration work, fiberglass and hull repairs, electronics, and rigging work. They carry a full stock of parts and supplies. The have a fuel dock (diesel and gas) and pumpout station as well. Bumble Bee Services make and repair marine upholstery and canvas. Doyle Botterell Sailmakers is a long-established sail loft. Mason's Chandlery aka 'The Store' is the largest chandlery on Lake Ontario. 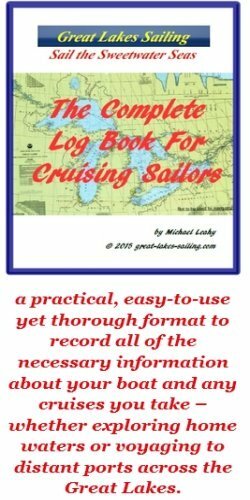 It carries virtually everything a cruising sailor could want including engine maintenance items, charts and chart books, safety equipment, hardware, clothing and much much more. Frankly, I love going there just to browse too. Caspian Custom Canvas is located just north of the marina. They do canvas and vinyl repairs, maintenance and cleaning. Genco Marine is a large chandlery with its main store in Toronto. The Port Credit store is located north of the marina where they manufacture canvas and cushion products. They offer a complete rigging service. Items stocked in the Toronto store can be delivered to Port Credit. Triton Sails are located just north of the marina. This is a full-service sail loft. They manufacture and repair other canvas products as well. They are equiped to carry out rigging repairs and maintenance also. Emergency services are available. Trillium Health Centre (905-848-7580) is the closest of the two hospitals in Port Credit / Mississauga. Hoopers Pharmacy (905-278-4242) has two locations - each of which is close to one of the harbours. Aielli Ristorante is well-known for its Italian cuisine. It is a short taxi ride but well worth the trip and smart casual attire. Breakwater Restaurant in the Waterside Inn is located on the east side of the harbour. It is an upscale dining room with a very good wine list. Their dining room and patio overlook the lake and the river. Brogue Inn is a typical Irish pub with a good selction of beers and Irish whiskys. It is located a few minutes walk from the harbour. Snug Harbour Seafood Bar and Grill is located at the Credit Village marina, overlooking the lake. This is a very popular restarant and it has a good menu. You can enjoy drinks and/or dinner indoors or outdoors on its lovely patio. Guests can tie up at their seawall. Port Credit Yacht Club dining room is open to visiting sailors from reciprocal clubs. It is well-known for its quality and excellent menu. It has a terrific view of the lake . Downstairs, you can enjoy a drink and more casual fare in the Chartroom Pub. Friday nightes, PCYC runs a very popular BBQ. Port Credit is part of the much larger City of Mississauga. Mississauga runs events all summer long along its waterfront. Mid-June sees the waterfront festival. Mid-July there is an art exposition at the Credit Village Marina. Mid-August sees Buskerfest. September sees the In-Water Boat Show and the Blues and Jazz Festival. There are shopping opportunities in downtown Port Credit and shops and malls on easy Mississauga Transit routes. You can also access Toronto with public transit routes linking directly to GO Train (rapid rail transit) and TTC streetcar lines. Park lands abound along the waterfront and there are lots of walkways and trails to wander and explore. This Port Credit tourism site will give you many ideas on getting the most of your visit.